This was another random stop over to break up the long journey between Malawi and Mozambique. Really remember nothing about it. 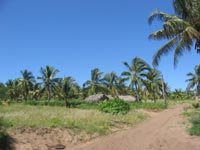 We spent a night at Vilanculos, the little town on mainland Mozambique used by most people when taking a dhow to the Bazaruto Archipelago. We were heading for Benguerra, the second largest island, tomorrow. Benguerra Island is no where near as commercial as it's big sister, Bazaruto. We stayed in basic woven huts, right on the beach. And the beach grew and shrank with each tidal change. In Mozambique, when the tide goes out, the water practically disappears for miles! 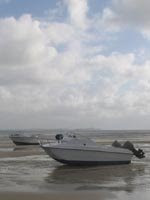 And this leaves the boats & dhows beached (as per pic). 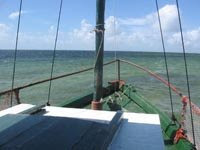 We did go out by dhow to 2 mile reef one morning and had a good snorkel around. It was beautiful and I saw turtles and even a small reef shark. Diving in Mozambique is amazing! We moved from one beautiful beach setting to another. 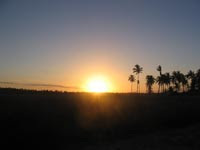 We spent our time in Inhambane on Tofo Beach. We celebrated a full-moon party and snorkeled with Whale Sharks! That was a pretty amazing experience, they're the biggest thing I've ever encountered under water and you're out in deep water, swannign around on the surface with them. I had to just keep reminding myself, they're here for the plankton! There's nothing you can see but blue for miles around, which means there's no coral, which means no fish, which (hopefully) means no real sharks! It was an incredible experience and I definitely benefited (again) from being a more experienced snorkeler (at this stage I had yet to do my dive qualification). En route back to South Africa, we spent a night in Maputo. We went and enjoyed our last night together as a group over some yummy Mozambique prawns (well, I had prawns at least)! It was a long tired drive back to Joburg, we were up early to make it to the border post as it opened. And I think we were mostly tired out from being on the road for 36 days (actually only 3 of us did the full tour, we lost & picked up others along the trip. I flew back to Cape Town with Bean the next day. He was headed there for the Easter break and it was the official start of our relationship. A quick Bean timeline: We'd initially hooked up on the 03/04 New Years Eve and I'd been up to Joburg to visit him for a weekend at the end of Jan04. We hadn't seen each other since and had barely communicated during my entire trip. He visited Cape Town again, later in April (as a surprise for my birthday) and I moved up to Joburg in mid-May04.